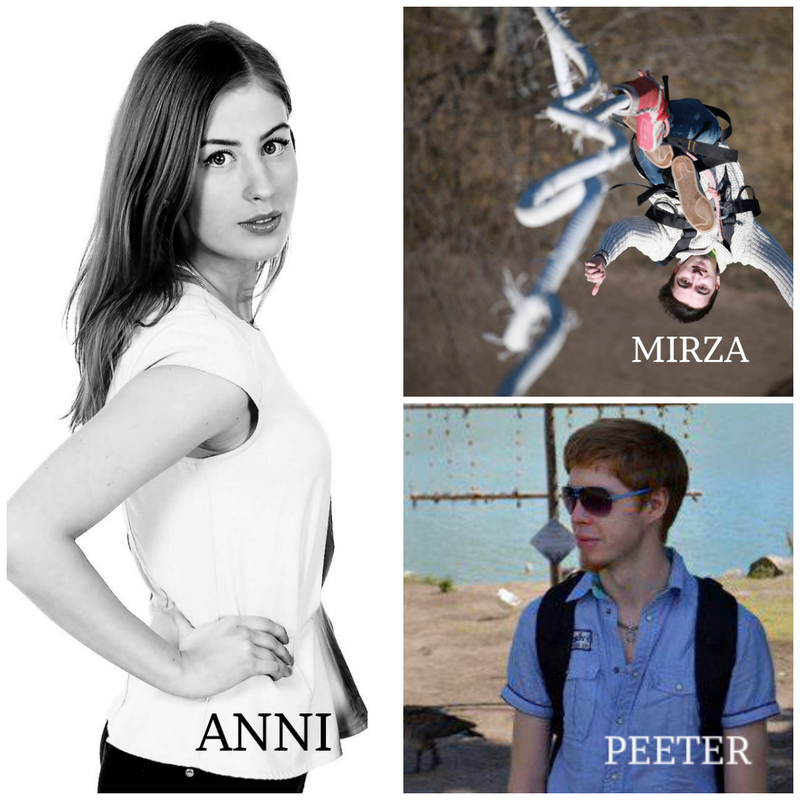 MBS Blogger: Hi Mirza, Anni and Peeter! First tell us about yourself and where did you hear about our Metropolia Business School? Mirza Hasanzade (MH): International Business and Logistics. Started in 2012. I heard about it through my brother who is studying in the Leppävaara campus. Anni Erkinaro (AE): European Management, second year. While searching for study places online. Peeter-Erik Kiis (PK): I am a 2nd year International Business and Logistics student. Group code is LD12S1. The first time I heard about Metropolia Business School was most likely when using public transportation. I remember that the school had an advertising campaign called “Be a star” or something along those lines. It caught my attention on multiple occasions and eventually I decided to look into it because I was in the process of choosing my university. MBS Blogger: Why did you want to study in MBS? MH: My brother was studying in Metropolia for one year already and he liked it so when I was searching for Logistics degrees in Finland and found out that there is one in Metropolia, I just had to apply! AE: It seemed interesting and something different from the tradenomi side, I also liked the fact that studies were wholly conducted in English. PK: For the entrance examination period I wanted to sign myself up for 3 exams to improve my chances of being accepted. My first choice of major was “Experience and Wellness management” at Haaga-Helia UAS but as it turned out I only managed to place as a reserve applicant because of my mediocre score. For Metropolia however I scored very high, well above the average. In addition to this I found the entrance examination process to be superb with a high number of international staff and a well-organized agenda/venue. Based on the entrance examination process and my suitability for the field of business I decided to turn down my reserve spot at Haaga-Helia and choose Metropolia Business School. MBS Blogger: How have you liked it here? AE: Mostly I’ve liked it very much. I love the international, family-like atmosphere. The native English-speaking lecturers know how to present subjects in an interesting way and give new perspectives. I’m also looking forward to the third year as I will conduct my compulsory but oh-so-exciting student exchange! PK: The first year was very intense because I chose many elective courses during both semesters. While the first year was tough I did learn a lot. As time went by I became happier because I knew I had made the right choice with Metropolia. The lecturers are all extremely professional and helpful when it comes to courses. They are also easily approachable with any and all problems one might have. Our class is highly diverse with people from a number of backgrounds. This makes group work more challenging but also more rewarding. Perhaps the only thing that bothers me at MBS is the fact that they decided to fire Heidi Kaukoranta, our international coordinator in the middle of the semester when we needed her the most. This is something they should have spent more time on before making any decisions which can deteriorate the quality of our studies. MBS Blogger: Any topic you are interested in? MH: Business Intelligence, Finance, Accounting. Because I am good with numbers and I’ve done great in these courses. AE: In my studies I find management and marketing the most interesting ones; I like interacting with other people and have some marketing-related work experience. PK: While enjoying all of my compulsory courses I did opt for some electives as well. Something that I found particularly close to my heart is the Asian studies. Mr. Jukka Lahtinen is the head lecturer who has been running the Asia courses at Metropolia for years now. The reason why I am so interested in them is because my wife is from China and I also spent a year living and working there. Therefore I am rather knowledgeable of the Chinese culture yet I still want to learn more. Currently I am finishing my 3rd intensive course with Mr. Lahtinen and as soon as I finish I will acquire the Asian Diploma. This diploma will prove highly valuable for my future as I see myself working in Asia-Pacific countries. MBS Blogger: Do you know what you want to do after Metropolia? MH: I am not sure what I want to do in the future but most likely I will work in Business Intelligence field or open my own company in Finland or maybe move somewhere warmer! One day at a time, no big plans yet! PK: After Metropolia I plan on moving back to Asia-Pacific with my wife. The whole reason why I moved back from China in the first place was to get an education. Owning a degree will help me significantly in realizing my aspiration, which is a career and a life in Asia-Pacific. Currently I am working part-time but this is only to make ends meet. I’m also planning my exchange year in Asia-Pacific and I have already contacted some schools to gather information about their programs etc. If everything works out I’ll be spending my 3rd study year in either Malaysia or China. In order to make all of this this work I will try to maintain a fairly high average grade so that my diploma would look good. If things go according my plans, the degree I will receive from MBS will assist me in setting up a good life in the Orient. MBS Blogger: Anything else you wish to add? PK: Not much to add really. The only thing left to mention is that not once have I regretted choosing MBS as my place of education. If anyone where to ask me: “Would you recommend me to go to Metropolia Business School?” I would answer yes a hundred times. Not saying that Metropolia is suitable for everyone, but for those who want a career in business it is THE BEST Finland has to offer. MBS Blogger: Thanks all for your time and wish you would have a great second year with MBS. There definitely is no place like Metropolia Business School but in no way is it “only a downhill” from there. Life is a series of unique places and experiences and we were lucky to have Metropolia to be one of our unique moments. I sometimes miss the classroom, especially when I can connect something that I learned in class to what I do at work. P.S: Who is this mysterious MBS Blogger? Thanks a lot for your sharing. It’s very great to hear your feeling about our MBS and it’s truly such a dynamic, vibrant environment for us to flourish! We hope you would have a great journey ahead and succeed with your future plan!